July is shaping up, just like the so-called summer weather, to be disappointing in the local real estate market. We're averaging just under 16 unit sales per day while inventory continues to rise at almost 3 times that pace. Sellers are thinking twice about listing, most likely because there isn't too much buying activity going on right now. The shine is off the market. Even the few people I know who have been, well perma-bull isn't an apt term, let's say firmly embedded in the it's always a good time to buy real estate camp, are starting to talk about other ways to make money. With six days to go in the month, can we hit 496 sales? Will some high-end home sales drag the average price back up or will we see a considerable decline? If we do see a decline, I think we'll witness a repeat of last August, and quite possibly into September too; two selling month's the local industry would love to never repeat. Sales volume is up ever so slightly from about 14 units per day to 15 units per day. If the trend holds, we will see around 465 sales in July. Any way you look at it, spin it, or close your eyes and ignore it, that's a dreadful number. It's in the range of the two worst sales volume surprise months in recent memory: August and September 2010. You may have already seen the TD Economics housing market outlook report that's been floating around the real estate blogosphere already. In case you haven't, here it is. Now TD Economics didn't specifically address the Victoria market. But they sure did go after the Vancouver market. They predict Vancouver will suffer a 14.8% drop in market value before the correction hits bottom. Based on the price/income and price/rent fundamentals that's extremely conservative. But let's take them at face value and say their predictions are spot on. Saskatoon will take an 11.1% drubbing. Toronto 11.7%. Heck, even cities that still haven't recovered from the 2008 correction, like Calgary and Edmonton, are expected to drop a further 6.4% and 6.6% respectively. And cities that missed out on the largely isolated Western housing decade of double digit gains (save Toronto) are still expected to drop anywhere from 5.6% to 8.3%. The Canadian average as a whole will drop over 10%. In case you're wondering, that's pretty significant. Especially coming from one of Canada's largest originators of housing related debt products. Forgive me, but I'm conjuring this number up on TD's behalf: Victoria will* drop 12.7%. That's $79,900 plus the cost of a family dinner at McDonald's or so. supply demand ratios that are already out of whack (Victoria especially in the multifamily dwelling category). All of those factors are just as real in Victoria as they are in Kelowna, Kingston, Saskatoon, Moncton, Antigonish or Shediac. We don't have an influx of mainland Chinese invading Gordon Head just so their kids can attend Frank Hobbs School (HAM). Nor do tourists spend much money in downtown art galleries anymore, so the local tourism industry isn't making people wealthy as fast as it used to. For that matter, more Victorians are out of work right now than in the last five years; in June 2011, almost three times as many households lost an income than those who went and bought a house. To which this post is dedicated to as a piece of (hopefully) sober second thought. Look, I've said it here since the beginning: if you can afford it, even when interest rates rise substantially (2% or more), can see yourself living in the place you buy for at least a decade, then give'r. Go get that roof over your head you've been dreaming of. There's nothing wrong with that. But if you can't answer yes, unequivocally, to those questions, keep renting or living in your parent's basement--either way you're saving money. Add the answer to this final question: Can you stomach seeing that home you just bought drop in value by roughly one year's before-tax income (at minimum) in the next few years (or 12.7%)? If you're set on shopping, I don't know where the deals are right now. I don't believe there are any deals to be had out there to be honest. I too am still confused by Victoria's market. It doesn't make sense. Each morning I wake up thanking the big spirit in the sky for intervening in my efforts to own a home in Victoria. But if you want to start researching, you can dig back through the many posts on this blog; you can get in touch with regular Realtor readers here to get yourself set-up with a VREB Matrix account and start viewing properties in more detail. You can use the map feature on the Realtor websites to pinpoint properties by type and location. Good luck and be strong. Anyone buying in 2011 is going to need to me thinks. There's a lot of things that drive me batty about the relationship between agents and the real estate marketplace, but perhaps none more so than the practice of gifting clients on completion. Sure, there a few examples of good gifts, like the gift of 70% cash back by buyer's agents who recognize the truth about who actually pays commissions on real estate transactions. But for the most part, gifts realtors give to their clients are given for one of two reasons: marketing or, because if they don't, they'll appear cheap. I remember the first time I heard about a realtor gift. A friend bought his first place. He spent about $300,000 if I recall correctly. His realtor, a young guy like himself, after earning somewhere around $6,000 for the time he spent on his client (I'm not sure how much, but I'd bet it was fairly considerable) before deductions etc, showed up at the closing with a brand new beer fridge for the garage, full of premium beer. It was the perfect gift for this single guy friend and it had our social circle talking. Good marketing, eh? Another couple we know gets a gift annually from their realtor, who they used once way back in 2003, and will never use again, mostly because of this gift: a custom-labelled 375ml bottle of U-Brew wine swill that wasn't drinkable the day it was bottled, complete with old-school photo of said realtor. These bottles get passed around our social circle as white elephant gag gifts and have been the source of many jokes about realtors, real estate and bad marketing in general. Until recently, we'd never received a gift. I don't begrudge the realtor we used for the commission they received. We made a choice to use a full commission buyer's agent and they made the full commission while spending less than 20 hours on us in total. Sure it pisses me off to no end knowing they "earned" more than $300 per hour while literally doing little more than scheduling viewing appointments and unlocking doors. But that was the rule of the game when we engaged their services and we entered into it knowingly. As they say: don't hate the player, hate the game. Sure we tried to find a cash-back agent to save some bucks. We weren't successful, obviously, nor were we patient enough to wait until we could find an agent with a cash back structure we felt was realistic (you'd be amazed at how many agents advertising cash back deals have more fine print than legal documents and end up at full commission in the end) Anyway, back to the gift. There's not much point in going into too much detail. The gift basket was crap. It was cheap. It was full of junk food and the one item that had any household usability was so engraved with marketing that we gave it away to Sally Ann. Even more, our agent called us that morning to ask what kind of wine we prefer: red or white? Here's the thing: when you only spend $10 on a bottle of gift wine you're going to save face by buying both, calling before hand to ask just draws attention to the cheapness of the gift. I'd love to hear from the realtors who frequent this blog: Why do you give gifts? What do you give? Are your gifts personalized with your name and contact info permanently etched into glass or metal? If so, do you think your clients appreciate this? I'd love to hear from other readers too: Do you appreciate the gifts? Anything positively memorable? Do you pass any on as gag gifts for the jokes they originally were? What gifts do you want to get? Should realtors just stop gifting altogether? The numbers above include the first 10 days of the month, so our regular weekly round-up of sales volume data is a bit off. Nevertheless, so far in July we're averaging 14 unit sales per day. If we compare that to roughly the same time frame in June 2011 (18.5 sales per day over the first 12 days) we can see sales volumes have dropped almost 25%. It's early, but I'd call that significant. If we maintain this pace, we'll see around 420 sales for the month total. Sales volumes drop into the summer annually, but by 25%? That's sharp. Listings volumes have dropped a little too. In the first 12 days of June 2011, we saw almost 50 new units hit the MLS each day. Right now we're averaging almost 41. This is fairly typical for this time of year. August and September were very bad sales months in 2010. 2011 is shaping up to be a bad year for the market if we isolate unit sales volumes as our indicator. 2011, after 6 months, is already 25% below 2010 numbers from the same months. Listings are higher as well, albeit only by around 5% or so. Prices should be falling right now, and very likely are, although the convenient law of averages keeps our reported average house prices at near-record levels. Interest rates: buy low or buy high? There's a conventional wisdom thought in the real estate world that buying a home during times of low interest rates is a good thing. This is very true at the beginning of cycles, but nothing could be farther from the truth at the end of cycles. Back in 2000-2001, when the Victoria real estate market started heating up after the doldrums of the 1990s, we watched interest rates drop over 3% seemingly overnight. If you'd bought a house then, you've likely done exceptionally well in the housing market (especially if you've stayed in it and not lost money to transaction costs). Average reported prices have grown at over 9.6% per year, or almost a full 3% per year higher than the previous 23 year history of appreciation in the Victoria market (1978-2001). See the correlation? Let's assume for a minute that the average Victoria first time buyers have an annual income of $100,000. They all have a minimum down payment of some varying degree, but let's say they all have to be CMHC insured. We'll work with the lowest common denominator of 5% down to keep these calculations simple. These folks are likely shopping for a single family home, preferring to be in the Saaniches, but perhaps settling in the West Shore when they see the differences their money can buy. Very few of these folks will be thinking to themselves, if I can't find a house I like, I'll just buy a condo. A few might consider, or even purchase, a townhouse. But the fine folks looking to live downtown in the new highrises aren't out shopping for fixer uppers in Marigold. These are different markets altogether. Affordability plays a huge role in real estate prices. Average households with average incomes, by and large, are out shopping for the average house. They could, relatively, easily get it in 2001-2004. 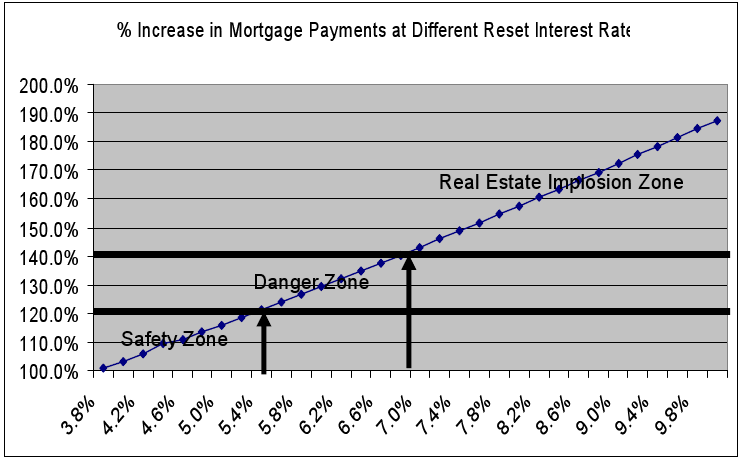 During the period 2004-2007 it became far more difficult for a variety of reasons, interest rates being one of them. Then in 2007, mortgage product innovation (extended amortizations and no down payments) coupled with drastic interest rate reductions in late 2008 and early 2009 coupled to pour gas on the fire of what was then a quickly falling market. There are no policy options left: the government's move to curtail extended amortization and no skin in the game mortgages (#fail), signals the death of these choices and fixed-term interest rates can't get any lower. Which leaves us where we are today: record high prices, coupled with record low interest rates, and some of the most unaffordable housing options in Victoria's history. If you do fit the mold of the above household, choose to buy today at your max, and interest rates rise 2% in the next five years, you could be perilously close to being underwater in your home should prices track affordability over the same time frame, which they mostly have over the past 33 year history in Victoria. If you've been reading the news or the real estate blogosphere lately, you'll have undoubtedly noticed a lot of commentary about a Canadian housing bubble. And perhaps you'll be wondering why I have not written about some of these stories yet. It's pretty simple: I don't believe there is a "Canadian residential real estate market" so I don't have much to say about it. For a market to be functioning it needs two basic things: actors on the supply side and actors on the demand side. Sure there are a few examples of supply-side actors who are active Canada-wide (very few). And perhaps there are examples of a minuscule few demand-side actors who are actively shopping for homes across Canada (though I doubt it). Even if someone drops a comment with anecdotal evidence suggesting their cousin's aunt's mother's daughter's sister is looking for the best luxury house $225,000 can buy from coast to coast to coast, I won't be convinced there's a Canadian housing market. Why is this important you may ask? Simple. Commentary about a Canada-wide housing bubble is purposefully designed to set-up a provable thesis: there is no Canada-wide housing bubble. And this is true. Same as there was no US housing bubble. No Irish housing bubble. No Spanish housing bubble and no Australian housing bubble. Instead, a bunch of local markets within these nations experienced conditions that led to actors on both sides of the markets speculating: supply side over-built and demand side over-bought; market balance turned to instability when a glut of supply met a dearth of demand and the inevitable lowering of prices began, and in many cases, continues. And the same can, and very likely will, happen within certain Canadian markets. Here's the thing: economists, nay, "journalists," like to lump these cities into a group called "Ka-na-duh" and ask the question "is it a bubble?" Then the industry mouth pieces and their enablers answer the question with "take Vancouver and Toronto out of the equation and no, Canada is not in a real estate bubble." Even if this is true, which it very likely isn't because there's a lot more cities that are over-valued than just the two largest, so what? It is an entirely useless discussion to homeowners and those who desire to own homes in specific locations. What should matter is the answer to this question: "is Victoria (or whatever city you insert) in a real estate bubble?" This is a question few local experts are willing to answer despite evidence of many fundamental economic measures pointing to extreme over-valuations. There are few local indicators of a shift away from present conditions, which is reason enough not to stake professional and academic reputations on any claims of future local market conditions. Sure, the industry types, who get a free ride from media who don't have the knowledge base, desire or editorial go-ahead to pursue the truth, are more than willing to spout off about "subdued, yet balanced valuation growth." Of course, those trying to sell books or stock market investment products/services are also given ample media opportunities to wax-poetic about housing Armageddon. But none of these positions have proven true, yet, and all of them have some semblance of "motive" that should have your skeptic meter flickering. Does Victoria have an over-supply problem? When we look at current market conditions it's evident supply is very high and demand is very low. There's anecdotal evidence of falling home prices all over the market, despite the unarguable fact that VREB average reported prices appear stable thus far in 2011, likely skewed by market activity within individual segments -- which is exactly why average reported prices are the favoured market-reporting choice of those collecting money through real estate transactions. Is Victoria currently over-valued? If we use historical average income/rent versus price numbers to perform any calculations the evidence is fairly solid. Same for Vancouver, Toronto, Ottawa and Montreal. Edmonton and Calgary too, although they're both down from previous peaks, same for Regina, Winnipeg and Saskatoon. Kelowna, sure. How about London? Possibly, but not nearly like Victoria. Or Halifax? Likely the same. Day late, but hey, we broke 5,000!!!!! In the first month that looked like it may match 2010 totals, June 2011 failed to. And we broke 5,000 listings, although expect 300+ to disappear from the market by Monday morning as would be sellers take their homes off the market to wait for more favourable selling conditions; it matters not though as these are market peripherals, dreamers and schemers only attempting to find the "one buyer" willing to value their property at some astronomical number conjured up by owners who's homes are simply "worth more" than their neighbours. It's not a good time to be a first-timer active in the Victoria market. Crappy offerings still dominate the low-end of the market. We don't have the reported average prices from the VREB yet, but I suspect that prices changes may show slight increases or flat. This isn't indicative of anything other than what's actually selling - there are all kinds of properties selling right now, but sharply priced mid-market homes are dragging average reported prices up. Buyers of these properties probably feel like they're getting deals and the sellers are probably bitter that their "investments" haven't made them a dime in the past 3 years. The Victoria market has truly been flatter than a Saskatchewan farm for some time now. Happy Canada Day weekend all.